December 21, 2013 – The chairman of Mozambican Civil Aviation Institute, Joao Abreu said today that flight recordings have confirm "there was an intention to crash the plane," that killed all six crewmembers and 27 passengers onboard LAM - Mozambique Airlines Flight TM470. On November 29, 2013 LAM - Mozambique Airlines Flight TM470 departed from Maputo International Airport, Mozambique at 11:26 AM Quatro de Fevereiro Airport, Angola in Luanda, the Angolan capital. Onboard the flight was 27 passengers and 6 crew members. The aircraft crashed in Northern Namibia, bordering Angola and Botswana near Rundu in a Bwabwata National Park. The aircraft was an Embraer 190 which was built in October 2012, it was registered as C9-EMC and named "Chaimite". The aircraft was reported to have 2905 flight hours. The airframe and the engines were last inspected the day before the crash. The passengers were from Mozambique, Angola, Portugal, Brazil, France and China. The pilot of Flight TM470 has been identified as Herminio dos Santos Fernandes. Chairman Abreu stated the pilot's motives were unknown. He further stated the copilot was not in the cockpit when the plane went down. It has been reported that the pilot logged 9,053 flight hours, his license was renewed in 2012 and he underwent a medical exam in September. The copilot could be heard on the aircraft flight recorders black box banging on the cockpit door trying to gain entrance to the cockpit. It was reported the aircraft was cruising at an altitude of 38,000 feet over Botswanan airspace. Halfway between Maputo and Luanda, Flight TM470 began a rapid descent, 100 feet per second. The aircraft was tracked by radar down to 3,000 above sea level. Air traffic control lost radio contact Embraer 190 over northern Namibia. The weather at the time was reported to be heavy rain with low visibility. LAM - Mozambique Airlines is the flag carrier of Mozambique. LAM Mozambique Airlines is based in Maputo, and operates scheduled services in southern Africa. The company is a member of the International Air Transport Association, and of the African Airlines Association. LAM Mozambique Airlines is on the list of airlines banned in the EU. 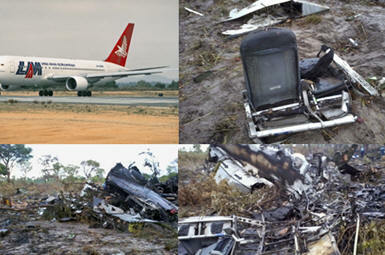 The Mozambican Civil Aviation Institute which is the civil aviation authority of Mozambique along with the Namibian Civil Aviation Authority, the civil aviation authorities of Angola, Botswana, Brazil and Mozambique as well the National Transportation Safety Board (NTSB) are investigating the crash of Flight TM470.